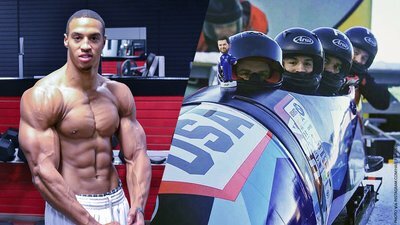 Olympic Interview: The Bodybuilder Who Became A Bobsledder! Eating and training like a bodybuilder helped Team USA athlete Hakeem Abdul-Saboor dial in his preparation for the 2018 PyeongChang Olympic Games. In this exclusive interview, he gives us all the details! When you think "bodybuilder," the Olympic Winter Games isn't the first thing that comes to mind. Yet PyeongChang, South Korea, is exactly where former physique competitor Hakeem Abdul-Saboor now represents Team USA in both the two-man and four-man bobsled competition. Abdul-Saboor began his career as a multi-sport high school athlete, but a torn ACL playing football in his senior year at the University of Virginia at Wise forced him to make a drastic change. With his muscular physique and competitive nature, bodybuilding was the next logical choice. Competing in the men's physique division, Abdul-Saboor did very well in several competitions, going so far as to place fourth in the 2012 Bodybuilding.com FIT USA event. But the stage alone was not enough to satisfy his athletic drive, and after spending a couple of years as a speed, agility, and quickness coach in Knoxville, Abdul-Saboor's athletic abilities eventually caught the eye of Dr. Brad DeWeese, former head of physiology for the U.S. Olympic Committee. Since then, Abdul-Saboor's competitive drive and athletic tenacity has secured him a spot on the U.S. Olympic Team, where he now competes on the world stage at PyeongChang. He'll be competing throughout the closing weekend of the 2018 Winter Olympics, from Feb. 23-25, which you can watch online at Olympic.org or on NBC sports. But Abdul-Saboor also graciously found time in his busy Olympic schedule to chat with Bodybuilding.com about his training, history, and his Olympic experience. How is preparing for the Olympic Games similar to preparing for a bodybuilding competition? My background in weightlifting and bodybuilding carry over significantly in my career as a bobsledder. Although my training is slightly different, I still keep plenty of the key factors I learned as a competitor. In bodybuilding, I periodized my training volume based on how far out I was from a show, and for bobsled I do the same thing. I had to peak for my shows just as I have to peak for my most important races in the Olympics. During my off season as a bodybuilder, I would go into a bulk phase in which I would try and gain mass and become as strong and gain as much muscle as possible. I lifted heavy and kept my repetitions low. Once I got closer to a show, my focus would go from trying to gain mass to trying to just maintain the muscle I acquired. My weights would get lower, and my repetitions would go up. Leading into the Olympic Games, I had a very similar game plan. The only difference was that now my lifts are mostly Olympic lifts like power cleans, snatches, and jerks, with some "normal" lift such as squats and bench press. To prep for bodybuilding, I would do more isolated lifts to focus on specific muscle groups, and now I focus more on total-body lifts that help increase power output. For pre-season for bobsled I was at my strongest and lifting at heavy percentages. Once I got into season, the focus then turned to maintaining the speed and strength I gained in the offseason. Now that I am at the Olympic games, I've tapered down to lower percentages so my body can be fresh for competition. Did being a bodybuilder help prepare you for the mental and physical challenges of becoming an Olympic bobsledder? The nutrition aspect of both bodybuilding and bobsledding went hand-in-hand for me. Although I don't have to be as lean as I do for a bodybuilding competition, I have to stay on top of my diet so that I'm not overweight for bobsled. We have a maximum weight limit that we can weigh with the sled and athletes together. The objective is to have the athletes weigh as close as possible to the maximum weight so the sled can race at a minimum weight. If the athletes are light, then lead plates have to be added to the sled in order to get close to maximum weight, which in turn means the athletes have to push a heavier sled. From my background in bodybuilding, I know how to manipulate my diet—and even helped with my teammates' diets—to make sure that all of us athletes would have the weight on our bodies vs. having to put extra weight in the sled. Gravity is a big factor in the sport of bobsled. My knowledge and experience in nutrition from bodybuilding helped me to gain and maintain the right weight to be the best candidate for the Olympic two-man race with my pilot. What is the athlete culture like at the Olympic Games? How is it compared to what you've experienced in bodybuilding competitions? The culture among athletes over here is actually similar to the culture of lifters and bodybuilders—at least for bobsledders. We all take lifting very seriously, and it is a big part of our success. We're faithfully in the gym working out at least five days a week. Monday, Wednesday, and Friday being our primary lift days, with Tuesday and Thursday usually consisting of accessory lifts and core. Tell me more about what life is like as an Olympic bobsledder. What do you do each day? Nutrition, performance, and training are all important aspects of being a good bobsledder. I wake up and make sure I have a nice solid breakfast to fuel my body. Breakfast is usually my biggest meal of the day, and carbs are the focus. After breakfast, it's time to go to the gym to lift some weights. I do about an hour-long warm-up in the gymnasium before going to lift. My warm-up consists of getting my core temperature up while doing lots of dynamic stretches and muscle activations. I need to make sure my muscles are firing correctly before going to lift my weights. I like to use my lifting session as potentiation for the bobsled training session later in the day. After lifting, it's time for meal number two, which consists of a protein shake and more carbs. Then it's time for a 20-30-minute nap of no-REM sleep which primes my body and re-energizes it for bobsled training. We have to leave for the track a couple hours in advance to set up the sled and make sure everything is ready on the sled for sliding. The sliding session consists of two heats sliding down the track. Depending on the day, the intensity we have to push the sled varies. In between heats, I have a light lunch or snack of simple carbohydrates to keep my energy levels high. Once we finish sliding, it takes another hour to break down the sled and make sure everything is intact. Then, I eat my first dinner, which is a balance of protein, fats, and carbs. Then, I turn my attention to recovery time, which may consist of a massage or cold tub, or using NormaTecs and foam rolling. After recovery time, I eat my last meal which is usually fat and protein based. Usually at this time I'm fairly tired, so I take myself through a light stretch session before going to bed. There is a lot of stress that goes through your body for bobsled, so the main focus is to try and stay healthy and fuel the body as much as possible so it can have the energy to perform at its best, day in and out. What surprised you about the sport of bobsledding when you started? When I first got into the sport, I didn't have any idea it would be this strenuous. The amount of time and effort required to be great in the sport is very surprising. We spend hours working on perfecting our bodies and our sleds for two runs down the track at less than a minute per run. Believe it or not, it's very much a blue-collar sport. Although a lot of time and effort goes into competing that I wasn't expecting when I first got into bobsledding, I wouldn't change it for the world. It is a great honor that I have made it to the Olympics, and I'm proud to represent the USA.